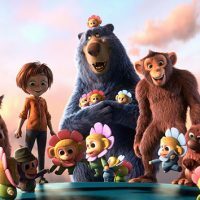 * Wonder Park — This 3D computer animated adventure centers on a creative young girl — voiced by newcomer Brianna Denski — who dreams up a whimsical amusement park, called Wonderland, inhabited by animals. She loses her sense of imagination when her mother, played by Jennifer Garner, falls ill, but rediscovers it after finding a real-life Wonderland in the woods, and teams up with the animals to save it from Chimpanzombies and bring it back to life. The voice cast also includes Matthew Broderick, Kenan Thompson, Ken Jeong, Mila Kunis, John Oliver, and David Cross. Rated PG. * Five Feet Apart — Split‘s Haley Lu Richardson and Riverdale‘s Cole Sprouse star as two young cystic fibrosis patients who try to carry on a relationship, despite being forced to maintain physical distance from one another to safeguard their health. Rated PG-13. * Captive State — Set in Chicago nearly a decade after an occupation by an extraterrestrial force, this sci-fi thriller follows a Chicago police officer — played by John Goodman — tasked with uniting the world against the extraterrestrial enemy. Ashton Sanders, Jonathan Majors, Machine Gun Kelly and Vera Farmiga also star. Rated PG-13. * No Manches Frida 2 — The original cast of the hit 2016 Spanish-language comedy No Manches Frida — Omar Chaparro and Martha Higareda — return, along with new faces of Itati Cantoral and Aaron Diaz, in the sequel about high school teachers leading their students off campus to hit the beach — but there’s be trouble in paradise. Rated R.
* The Aftermath — Keira Knightley and Jason Clarke star as a British colonel and his wife assigned to live in Hamburg, Germany during the post World War II reconstruction, but tensions arise with the German, played by Alexander Skarsgård, who previously owned the house in which they live. Rated R.
* Yardie — Idris Elba directed this film adaptation of Victor Headley’s novel of the same name. The word is a slang term that refers to occupants of housing projects. Like the novel, the film is set in 1970s Kingston, Jamaica and 1980s London and follows the rise of a young Jamaican, played by Aml Ameen, in London’s drug-dealing underworld. Also starring Shantol Jackson, Stephen Graham, Sheldon Shepherd and Naomie Ackie. Unrated.